Dr. Cochrane specializes in disorders of the mouth and gums. He does dental implants, recession repair, treats periodontal disease and TMJ problems. Dr. Cochrane is an expert in the field of implant dentistry and periodontics. In addition to his Doctorate in Dental Surgery he has degrees in Periodontics, Prosthodontics and Oral Biology. 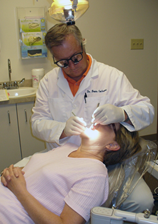 He has been treating periodontal problems for over 30 years and placing dental implants for the last 25 years. He also provides expert care for people with temporomandibular joint pain and soft tissue problems, such as recession, cysts and tumors. Dr. Cochrane can perform a full range of dental implant procedures and diagnose and treat facial pain. In addition, he can offer reconstructive and cosmetic solutions for missing teeth. Dr. Cochrane is prepared to complete surgical procedures needed to improve your oral health and the aesthetics of your smile. He is trained in oral sedation for patients who have dental fears. He is a member of the American Academy of Periodontology and the American College of Prosthodontics. Dr. Cochrane is currently a trustee for the Iowa Dental Association. Dr. Cochrane Now Offers a New Treatment for Receding Gums! The Chao Pinhole Surgical Technique requires no cutting, no sutures and virtually no downtime. “This is a revolutionary alternative to gum grafting,” says Dr. Cochrane. Why is bleeding so important to your oral health? Which patients are good candidates for Perio Trays ®? How important is it for your team to be Perio Protect ® trained? How has Perio Protect ® changed your practice? Why is Perio Protect ® Important? Periodontist R. Bruce Cochrane, DDS, MS was the keynote speaker at the 2013 Perio Protect Annual Meeting. Dr. Cochrane has used the Perio Protect Method since 2007 and explained how he treats his patients with the Perio Tray delivery of medication in this video.